In 2009, supermodel Kate Moss caused a stir when she categorically stated that “nothing tastes as good as skinny feels.” As jaw-dropping as the sentiment might have seemed to many, Moss’ pithy comment encapsulates a modern Western zeitgeist. From an evolutionary perspective, however, Moss’ statement is ludicrous, if not preposterous. Such a statement could only be made by someone who is not concerned with figuring out where her next meal will come from, much less how to make it through the next winter or dry season without starving. Cross-cultural research among 11 Western and non-Western traditional societies suggests there has been a rapid and recent “globalization of fat stigma.” Until at least the 1990s, several of these societies, including American Samoa, Puerto Rico, and Tanzania, were considered “fat positive,” meaning they demonstrated a preference for plump bodies. But in the last two decades, with increasing globalization, these same countries have begun to stigmatize fat. Whereas fatness was once thought in those cultures to represent fertility, wealth, and beauty, it is now associated with ugliness, sexlessness, and undesirability. It should be emphasized that these stigmas cut across emotional, psychological, and physical categories at both the individual and societal levels. The reasons for this rapid transition are complex, but research in Fiji and elsewhere suggests it occurred with the introduction of television and global media and the resulting exposure to largely Western culture, mores, and entertainment. Now, in addition to the health and physiological problems associated with fatness, there is well-documented emotional damage due to the “pathologization of heaviness” in these societies. These cultural shifts are startling, and they lead us to wonder how various body types—and fatness—were perceived in ancient cultures. But getting at this question isn’t easy. It is relatively straightforward to study variations in the height of ancient people by measuring long bones (that is, arms and legs) recovered in burials and making calculations based on those measurements. It is far more difficult to study the weight of ancient people. What would you measure? Fat is soft tissue that decomposes rapidly after death. Photo credit: Ziko Van Dijk. CC-BY-SA. One might surmise that taller people are larger, and therefore heavier, than shorter people. But that doesn’t tell us much, and certainly doesn’t tell us anything about the proportion of overweight people in the past. Equally confounding, the relationship between height and weight doesn’t always hold: There are lots of short, round people who weigh more than tall, skinny people. Archaeologically, we simply can’t tell who was fat from the bones we excavate. In order to study fatness in the past, we have to turn to artifacts. 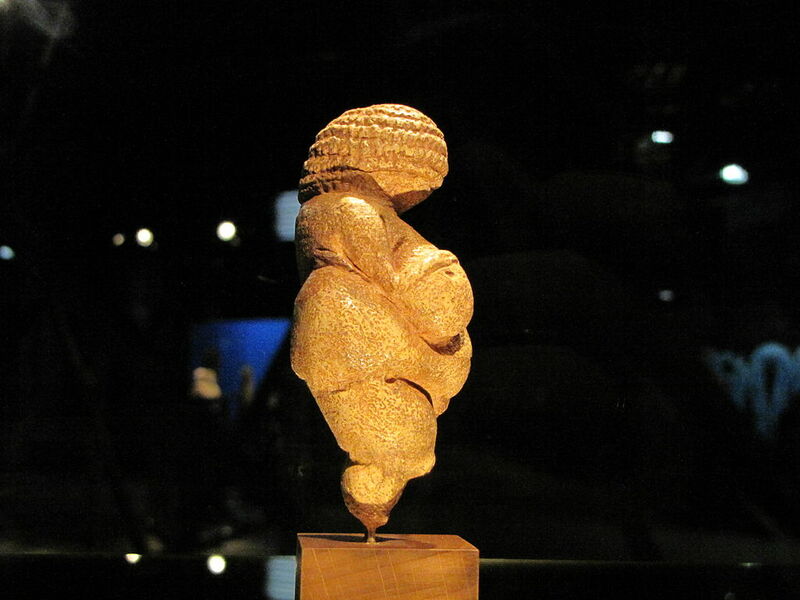 One of the most famous artifacts illustrating obesity in the archaeological record is the Venus of Willendorf, one of many so-called Venus figures from Upper Paleolithic (“Old Stone Age”—around 50,000 to 10,000 years ago) sites in Europe and Central Asia. Discovered in Austria in 1908, the Venus of Willendorf is an 11-centimeter-tall figurine carved out of limestone, decorated with red pigment, and dated to between 25,000 and 27,000 years ago. The body is detailed and anatomically correct, but the face and head are covered by a woven hat so that the face is not visible. But one thing is obvious: She is more than plump; indeed, she is fat. There are now more than 200 unique Venus figurines known from sites across Europe and Central Asia spanning more than 10,000 years. Although all depict females, a wide range of body types are represented and not all are so clearly obese. It is therefore difficult to say conclusively that they constitute a record of fatness. Another famous set of figurines was found in Neolithic (“New Stone Age”—roughly 11,000 to 4,000 years ago) sites on the island of Malta and elsewhere in the Mediterranean region. Dating to about 5,000 years ago, the so-called Fat Ladies of Malta depict seated or reclining female figures, many of which are missing their heads. Where heads are present, they are often incongruously small in relation to body size. There is no suggestion that the figures are pregnant, yet all are clearly overweight. Most of the Maltese figurines have been found in burials and mortuary shrines, adding credence to the idea that there was a cultic or religious aspect to them and suggesting some degree of specialness and perhaps reverence. What about men? Is there evidence of fat men in the past? One example is a jade carving from Guatemala known as Fat Lord and Frog, which dates to about A.D. 700. He is clearly someone special (lesser folk did not get their images carved and preserved in jade). He is also obviously obese, but we don’t know why. The Venus figurines, the Fat Ladies of Malta, and the Fat Lord and Frog suggest that some fat people were held in high esteem in past cultures and that the societies from which they emerged may have believed that fatness is goodness—or at least that there is nothing wrong with being fat. It will take a massive, comprehensive, cohesive research project bridging archaeology, anthropology, physiology, psychology, sociology, and public health to begin to truly understand the relationship between fatness and human societies reaching back millennia. That research will prove challenging because fatness, while demonstrably a public health challenge, leads to negative social stigma and prejudice that make understanding the issues, much less acting upon them, even more complex. But that doesn’t mean it isn’t worth pursuing. Thanks to Sapiens for this one.